Alex Oxlade-Chamberlain is back after sitting on the sidelines for almost a year since rupturing his cruciate ligament in April last year. Chambo stepped out for Liverpool U23s against Derby County on Friday afternoon and had the joy of wearing the number eight shirt; there’s an extra layer of enjoyment for the midfielder as he once said he “always wanted to be Steven Gerrard“. 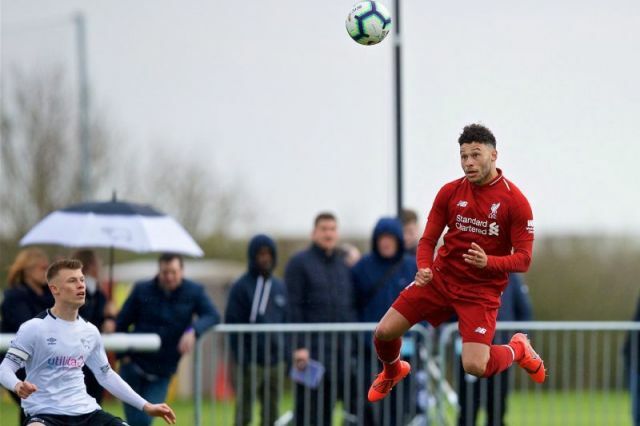 Oxlade-Chamberlain started the game at Derby and played 41 minutes before being replaced by Isaac Christie-Davies. The midfielder then headed straight for the changing rooms which did cause some concern. Oxlade-Chamberlain off after 40 minutes. There was a period earlier in the half where it looked like he was holding his hamstring. Not sure he was moving as freely as he could. Might be wrong. Plan was for him to play the whole half. After being taken off, he did seem to indicate that he was asked to call it a day and was apparently only taken off as a precaution because he felt something in his hamstring. The midfielder was gelling well with his younger counterparts too with Goal’s Neil Jones complimenting his passing abilities on Twitter. There shouldn’t be too much panic around Oxlade-Chamberlain’s hamstring as the lad hasn’t played a game of football for almost a year. It’s to be expected that he may feel rough after 40 minutes. These are the sort of steps the Ox will need to take if he’s to make a senior appearance for us this season. With just nine Premier League games remaining, it’ll be cutting it fine if he’s to have an impact on our domestic campaign this year.